Ford is not going to move its production of its Focus hatchback to the U.S. from China, even though President Donald Trump claimed on Sunday that the taxes he imposed on imports from China mean the Focus Active is now able to be built in the United States. Citing the new tariffs by Trump, Ford almost two weeks ago said it would drop its plans to ship its Focus Active to the U.S. from China. On Sunday, Trump went on Twitter to declare victory when he wrote that this was only the beginning and the Focus can be now built in the U.S. and Ford does not have to pay tariffs. However, Ford in a prepared statement released late Sunday said that it is not profitable to build its Focus Active stateside given that forecasted annual sales for the vehicle are less than 50,000. At this point, Ford will simply not sell that vehicle in the U.S. An automobile industry analyst said Ford could make its Focus’ in many plants around the globe, but if they continue to sell a variant to the Focus in the U.S. several options exist other than having it built in the U.S. This past April, Ford said that it had plans to stop manufacturing cars in the U.S. except for its Mustang and would focus on its more profitable SUVs. 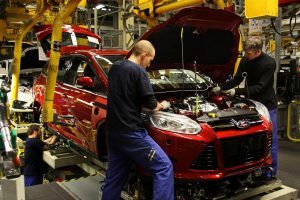 In May, the automaker stopped the manufacturing of its Focus sedans in its Wayne, Michigan plant. The plan, say analysts was to pare down its lineup of Focus to just Active wagons and to import them, and that plan was solid for the model in the U.S. market, without tariffs. However, everything was changed by the tariffs. The U.S. began imposing its 25% tax on July 6 for $34 billion in imports from China, including autos. In August, the White House added new tariffs to $16 billion more of Chinese goods and is preparing to add tariffs on another $200 billion. China has retaliated with tariffs of its own on products from the U.S. The two largest economies in the world are battling over allegations by the U.S. that China has deployed predatory tactics that included cyber-theft to steal technology from companies in the U.S. as a way of challenging the technological dominance the U.S. holds.